Travelling is always a good idea but eating like the locals is a very authentic experience and it’s much better rather than going to a fast food chain. By trying the local food, you get a different perspective of the culture and you learn the typical ingredients of the region. In this article, we are going to talk about where to eat in Gran Canaria which is a feast for the palate. Due to its location, you will find mixture cuisine of Spanish, African and Mediterranean flavours which explains why eating in Gran Canaria is so special. Going to Maspalomas and not stopping by La Proa Casa Reyes, it’s like going to Rome and not visiting the Colosseum. The restaurant is waiting for you right next to the ocean. While there, enjoying the beautiful views, a delicious paella accompanied with a glass of wine will surely make your time in Gran Canaria 10x better. As a final touch to the whole experience and excellent customer service, a sweet end with tiramisu is always a good idea! 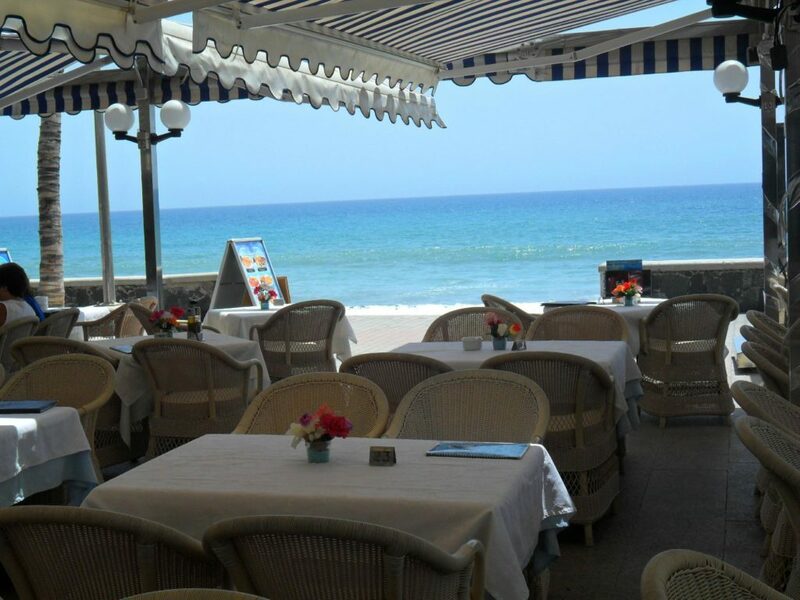 Located on the bay of ‘’El Pajar’’ beach, Bar el Boya first opened doors in 1952. It offers stunning views and excellent Canarian food. When the temperatures start to rise around noon time and you want to refresh, Bar el Boya will delight you with a delicious sancocho. A symbol of the Gran Canaria’s cuisine, the sancocho is a traditional soup that it’s a mix of different meats (beef, pork, chicken) but also with vegetables. The version of Gran Canaria is sancocho with a fish cooked on a platter. It’s Friday’s specialty of Bar el Boya and it costs 7.90 euros. 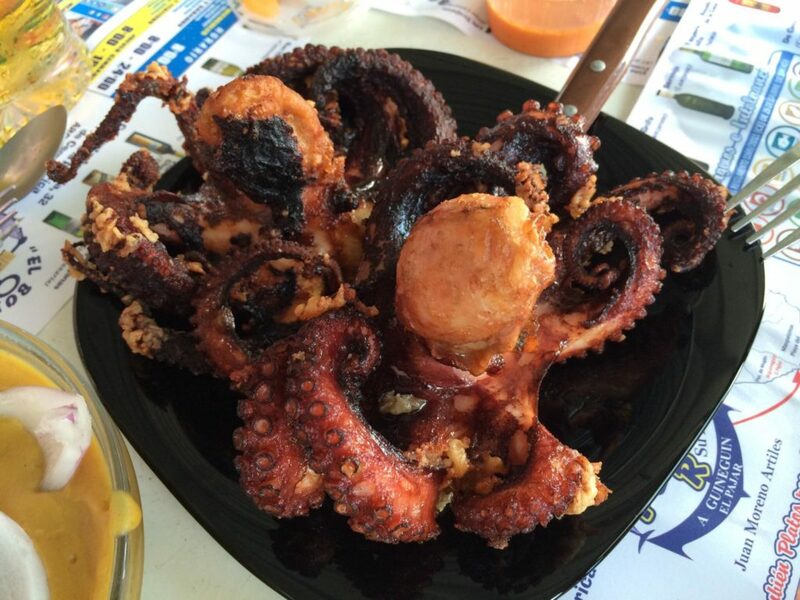 While still there, take advantage and try the pulpo (octopus) which is also one of the restaurant’s specialties. This restaurant comes in an extraordinary form. Tagoror Cueva de Bartolo is a cave restaurant as we can notice from its name (cueva = cave in English). Typical for this region, eating in a cave is an authentic experience that you should try at least once in your lifetime. Moreover, this cave restaurant offers typical Canarian dishes such as Gofio ‘’Escaldado’’ and ‘’Papas arrugadas with mojo’’. The Gofio is perhaps the most traditional food of this land. It’s sort of a Canarian flour made from roasted grains and other plants such as bean. The composition of Gofio Escaldao consists of obviously the gofio with a brewed fish broth. 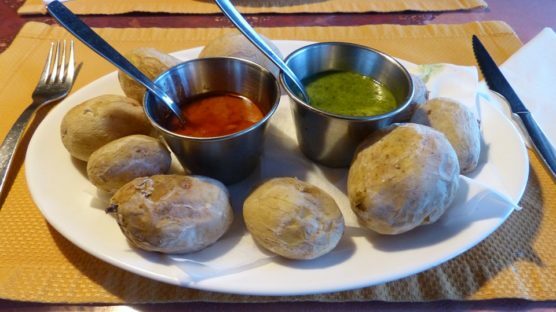 On the other side, the ‘’Papas arrugadas with mojo’’ represents of the mojo sauce which is mainly made of oil, garlic, vinegar, salt, red pepper, coriander and other spices in a combination of small unskinned potatoes. The unique environment and delicious dishes, make this place so hard to resist a lunch in it! When arriving at Casa Josefina you will notice that it’s a place, little known from the tourists. Its interior is also special with hanging subjects from the ceiling. The stars of the menu are the roasted leg of lamb and the chickpeas. The leg is cooked in an oven and comes with fresh chips – both very yummy. As the leg is too big for 2 people, you can order it for sharing between 3 or 4, and in that way, you can try the chickpeas and a Canarian cheese as a starter. Bon Appetit! Wednesdays and Thursdays: 10 am to 5 pm. Sundays: 10 am to 6 pm. 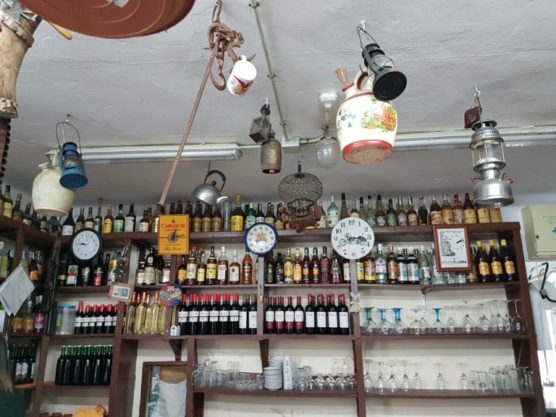 Casa Bernardino is the answer of where to eat in Gran Canaria. It offers homemade dishes and everything is so tasty that it’s hard to choose just one from the menu. The location makes it very attractive for both tourists and locals thanks to the view you can enjoy from the restaurant. 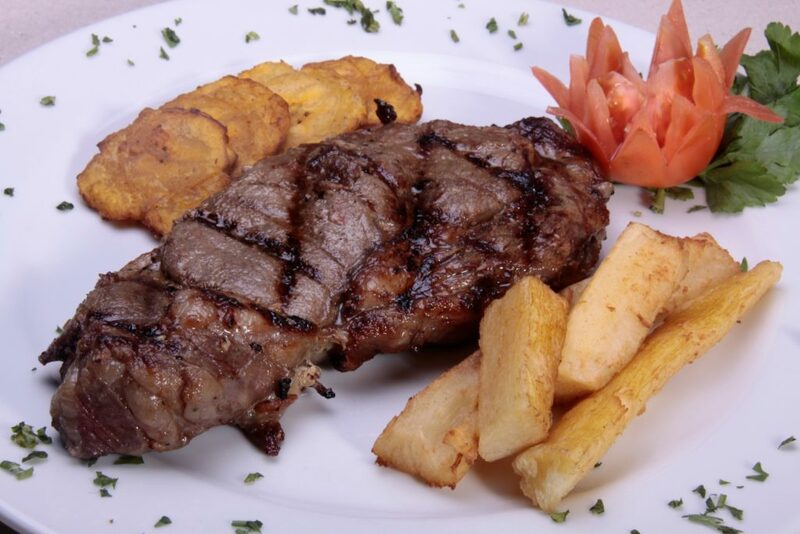 The must-try dish are the famous costillas con papas which is ribs with potatoes and corn and the grilled varieties of meat. If you wonder where to eat in Gran Canaria, Qué leche is the place to be! First, it was meant to be a coffee shop focused in yogurts, cheeses and artisan ice creams. 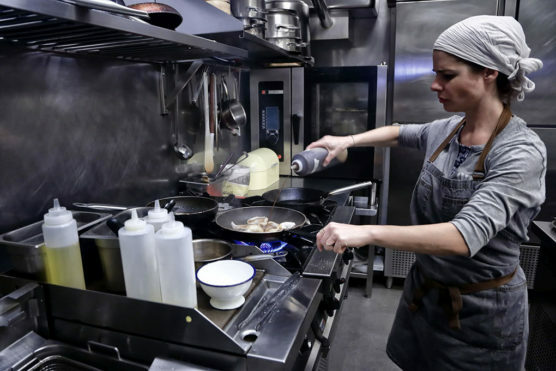 However, the owners decided to turn it into a restaurant where people can not only come for breakfast and brunch but also for lunches and dinners. On top of that, the restaurant is located in the XVII century building. The walls that separate the eating zone from the bar and the kitchen are preserved which brings even more authentic environment of the restaurant. What is special about this restaurant, except its desserts, is the bond between the owners and their clients. Therefore, be sure that everything you try out is made with lots of love and passion. Where to eat in Gran Canaria can be a difficult choice due to the many options that people have. However, we picked the best 6 places where you can eat in Gran Canaria. If you have more suggestions that we can add to our list, we are ready to read them! Perhaps, you will be also interested in reading things to do as a couple and our travel guide of Gran Canaria with kids.